Today is Honest Abe's birthday. He was born in 1809. There was a time when this portrait, along with that of George Washington's, graced the walls of every classroom in America. He was like a God. But now we are a bit older and more jaded, and we hear much talk about Lincoln's real purpose with the Emancipation Proclamation was to cripple the South as far as labor was concerned, while doing nothing to free the slaves in the Union held States. This is all very true. We also hear much talk of State's Rights being the true cause of the Civil War in lieu of slavery. And that reminds me of a story that concerns Old Abe and State's Rights. Like most good stories, there is not likely to be any truth to it, but it does make it's point. I heard this tale about 30 years ago, and have used it many times in illustrating just how inter-dependent we are on one another if we are to make the world a better place in which to live. I hope you enjoy the story, and moreover, I hope you get the point..
Abe Lincoln was riding on a train when the man in the seat next to him lit a big cigar. The smoke, and smell, of the cigar was wafting across Mr. Lincoln's face, making it hard for him to breath. He politely asked the man, "Sir, your cigar smoke is causing me great difficulty. I wonder if you would mind putting it out?" The other man looked at Lincoln and said, "Sir, I will have you know that I paid for both my seat and the cigar. If I wish to smoke the cigar, and it bothers you, that's too bad!" With that he sat down and blew a large cloud of smoke across Mr. Lincoln's face. Lincoln reached down into his bag and drew out a large pistol, which he then pointed at the other man's head, stating as he did, "I, too have paid for both my seat and this pistol. If I chose to shoot it and the bullet bothers you, I suppose that is the same thing?" The other man extinguished his cigar..
Lincoln was a most crafty lawyer, arguing, in different cases, successfully, both for and against clients in cases that involved the Fugitive Slave Act, which required that all runaway slaves were to be considered property and returned to their original owners. Lincoln argued, quite easily in one case, that the slave was indeed the property of his client. The slave was returned to his owner. In the other case he argued that since the trial was taking place in a free state, the runaway slave had all the rights of a free man, and therefore could not be treated as property by the law. That slave was given his freedom. There is a reason that Abraham Lincoln is so important to the history of this nation. It's not that he freed the slaves, or split rails. 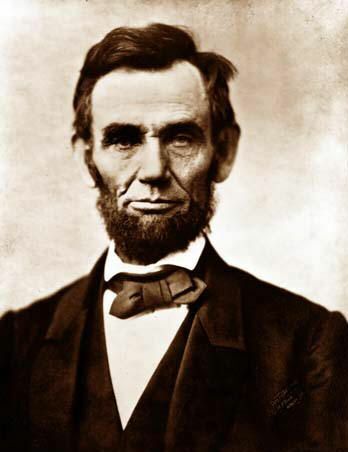 The reason that Abraham Lincoln is still so important to us today was spoken by Old Abe himself during his 1858 acceptance speech as the Republican Candidate for Senate, when he said, "..a house divided against itself, cannot stand." Truer words were never spoken, nor so apt as they are today.